Mathrubhumi International Festival of Letters in Thiruvananthapuram is proof that literary festivals can go the green way. Most festivals have something going for them – size, format, location. What I really liked about the recently concluded Mathrubhumi International Festival of Letters in Thiruvananthapuram was the fact that it was plastic free. For years, I have attended major and minor cultural events and cringed at the sight of growing mounds of plastic. Bottles and bottles and bottles of mineral water in ever decreasing sizes. I would drink from those bottles too, all the while thinking: This is us, writers? Critical of governments and those who are not thinking of the weak, the voiceless, the planet herself. How have we become people who can’t drink from a glass? I understand that there may be concern for visiting foreign writers whose bellies are not used to our Indian bugs; thus bottled “mineral” water. But surely the event could install a giant bottle and a dispenser and expect those guests to help themselves using ceramic mugs, or paper cups? Besides, plastic use goes far beyond water. There’s plastic decor, synthetic lanyards, plastic lamination on cards, plastic plates and spoons, endless food packaging. The worst of it is that, the more plastic there is in evidence, the less incentive anyone has to try and minimise the amount they use. Big events set a precedent. Smaller events take their cues from them, thinking that’s the way things are done. When I first started attending book events, it was the norm to find dozens of glasses of filtered water kept on a table. Now, 250 ml or 300 ml plastic bottles are the norm. At lunch, I end up opening not one but three bottles; over the course of a day, that could be as many as six bottles for each attendee. Most people don’t even bother to finish a whole bottle of water. They open up fresh bottles, take three sips, and abandon it. Nobody else wants a used bottle, so an almost full bottle lolls about on a chair until someone bins it. 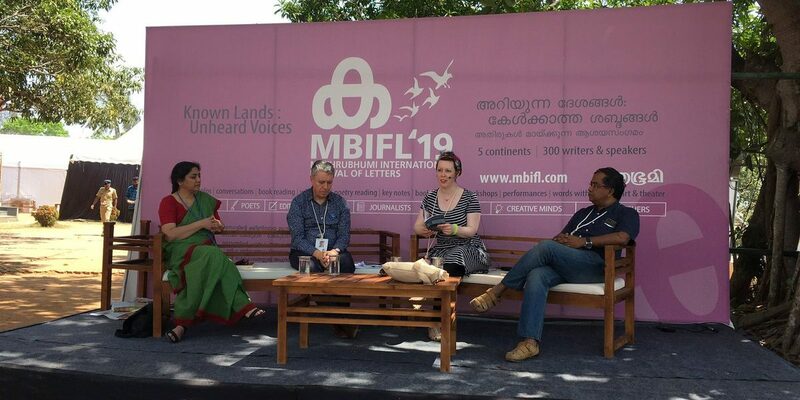 Then I arrived at the MBIFL in Trivandrum. Each guest was greeted with a garland of cardamom, following local tradition. The welcome kit included a registration card, but it was paper and not laminated. 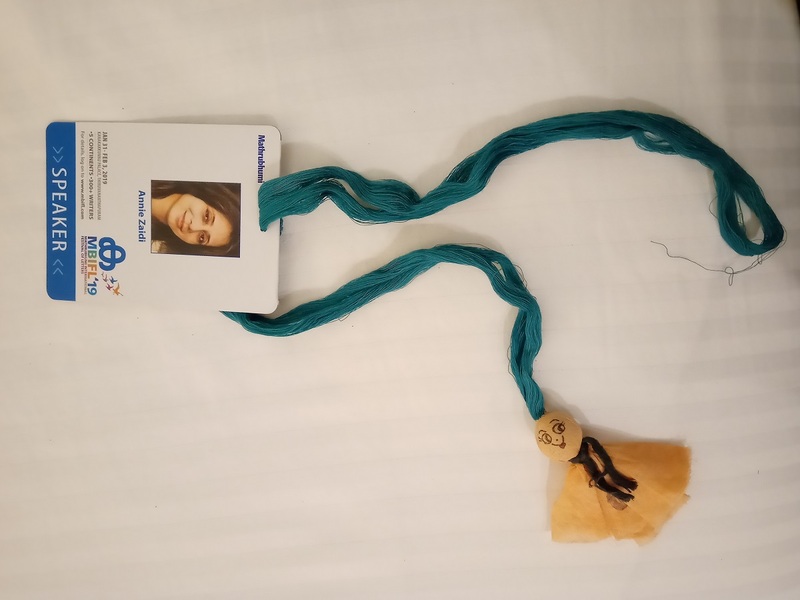 The lanyard thread was pure cotton, and edged with a tiny cloth rag doll, the chekutty. The festival took its ‘green protocol’ seriously. A handful of snacks were put in brown paper envelopes, and placed in a soft cotton bag. One of the gifts was a metallic water bottle, so we could avoid buying water not just at the venue, but after. There were glass jugs on stage and nearly everywhere else. Sure, there were the 20-litre bottled water cans in a backroom, but that was the absolute minimum. Going plastic-free has, as well, great aesthetic appeal. Brown paper and cotton thread are beautiful. Trying to avoid plastic also meant that the festival avoided commercial sugary juices, colas and chips. We drank actual fresh fruit juice, with the option of not adding white sugar. I cannot quite describe the joy of having this alternative. A few stalls, selling food and coffee, had probably been instructed to use exclusively metal or glass, for there was no plastic waste evident. I quickly got used to filling up my bottle and carrying it around. Many cultural festivals have followed the custom of providing jute or cotton sling bags for all registrations, often sourced from non-profits or women’s groups. This is great, but it doesn’t make sense carrying a jute bag while consuming plastic in every other form. India has a living tradition of making goods with glass and disposable organic alternatives. We grew up eating off leaf plates and drinking in clay cups. Nor do we have any shortage of labour to do the washing up. We also have a fairly organised system of hiring crockery and metalware for weddings. It’s not like there is any material or financial hindrance to following a green protocol. If festivals can spend crores on lighting, sound, décor and video production, they can hire a team (and pay them) to wash glasses. Annie Zaidi is the author of 3 Plays, Gulab, Love Stories # 1 to 14, Known Turf: Bantering with Bandits and Other True Tales, and the editor of Unbound: 2000 Years of Indian Women’s Writing.